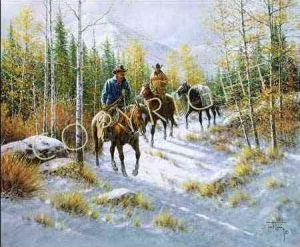 Many times in mid October, snow will move in with the early cold fronts before a cattleman has moved all of his stock down from the high country for the Winter. We rode this Autumn day to gather strays out of the mountains. The job took longer than expected. It seemed the cattle were fond of the grass and the solitude and weren't concerned with the "Early Snow."